Moti the injured pony rescued from the Maidan on Holi, is recovering in the company of around 500 dogs at the Sonarpur hospital he was taken to. The eight-year-old pony, who used to give revellers a ride on his back in front of Victoria Memorial till his owner abandoned him two months ago, is getting better, doctors at the hospital, named Chhaya, said on Friday. The horse was abandoned after he developed an infection in the back following an injury. Pony-owners in the Maidan area blame the injury on inept handling of the saddle by Moti’s owner. “Maggots had grown in the injury because of the infection. The horse is responding to treatment. He is gaining in strength and not falling down like before,” said an official at Chhaya, co-founded by Sharda Radhakrishnan, a former teacher at Ashok Hall, and Vishakha Doshi, who lives in London. Indra Bhattacharjee, a resident of Kasba, had spotted the horse lying on the Maidan on Holi while he was riding past on his two-wheeler. He stopped his motorcycle, clicked some pictures of the pony and posted them on Facebook. 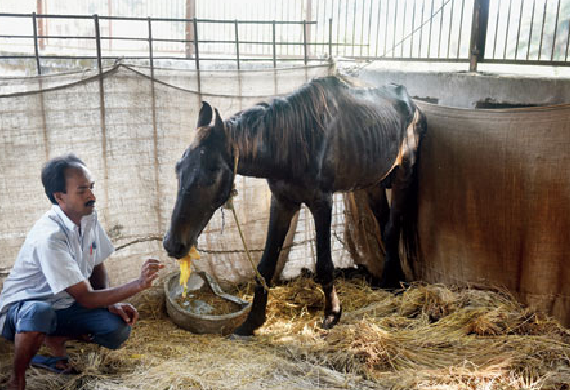 The post registered multiple shares and resulted in a flurry of activity by NGOs and concerned individuals, leading to the horse being shifted to the Sonarpur hospital. During a visit to Chhaya on Monday, metro found Moti in his temporary stable that had a bed of straw and ample supply of grains. The wing where the stable is located is home to around 500 dogs and is away from the cowshed where five horses and a foal have been put up. In Moti’s direct line of sight is an enclosure housing two Neapolitan mastiffs, a French mastiff and a mongrel. One of the Neapolitan mastiffs, named Zico in the hospital, had been left tied to a lamp post in Kolaghat, East Midnapore, in 2015. He was brought to Chhaya after residents of the area failed to locate the owner. The abandoned dogs who have found refuge at Chhaya are of breeds such as Rottweiler, alsation, great dane, bull mastiff, spitz, golden retriever and Labrador. Munna, a Labrador, was found abandoned at Dhakuria station with maggots in both eyes eight years ago. He recovered fully at Chhaya and was in prime of health till he developed a kidney problem recently. There are separate enclosures for dogs that are accident victims, puppies and those that are terminally ill.
Also, there are 66 kennels housing four-five dogs each. These dogs are taken to Chhaya for sterilisation and are returned to their respective paras after four-five days. “We sterilise 120 dogs from different parts of Calcutta every month. Over 7,000 dogs have been sterilised in the two operating tables at our facility since 2010,” said Radhakrishnan. There is a big cage only for kites that get injured on kite lines, especially those laced with the Chinese manja. “Even after they are released, many birds come for food,” Radhakrishnan said. Radhakrishnan runs the hospital with 26 workers recruited from local villages. There are four drivers for two pick-up and delivery vehicles. The outpatient wing functions twice a week, while doctors are on call on the rest of the days. Chhaya, spread over a little more than two acres, is facing a cash crunch. “We run on voluntary donations. The cost of running the organisation has gone up from Rs 30,000 a month to Rs 6.5 lakh a month. We are forced to restrict our operations because of a funds crunch,” said Radhakrishnan. Prev Previous post: ! IMPORTANT !